Raquel Rodriguez sat at a table facing half a dozen kindergarten students. The instructional aide at Four Corners Elementary School held up a set of cards with vowels and consonants on them. “Rrrrrra,” she said slowly, her rolled r carrying across the table. The students echoed her. Later, they moved into sounding out words. Rodriguez’s group is part of the school’s effort to get every kid on track for reading. The task is significant. Kids at Four Corners come into kindergarten recognizing just four English letter sounds, on average, and about 10 letters of the alphabet. Compared to their peers across Oregon, they’re behind. Students at Four Corners spend hours each day focused on reading and literacy, learning from their teacher as a whole class. Rodriguez’s small group is extra: a 35-minute session, every day, where kids get extra help depending on their needs. Doors between two kindergarten portable classrooms opened as students rush to their assigned station. One teacher stood in front of a slightly larger group seated on the rug in front of the class whiteboard. She pointed to letters taped above the board and walks the children through sounding out each one. In the neighboring classroom, another teacher sat at a table, leading a group through flash cards of common Spanish words students should be able to recognize by sight without sounding them out: fui (I went) and con (with). A handful of students who were reading at grade level worked independently, using tablets for a Spanish reading program that adapts to their skills. That program is new this year - something Rodriguez researched and asked Decker to buy for the school to complement a similar program in English. “There’s been more materials readily available for English instruction, whereas in Spanish the teachers are having to make them or even translate,” she said. Four Corners has been one of Salem-Keizer’s persistently challenged schools and has spent most of the past decade on Oregon’s list of schools most needing improvement. That is largely based on test scores and growth: how much students improve those scores year-to-year. Last year, just 14 percent of students met state standards for math. Students performed better on reading, which has been more of a focus: one in five students passed state assessments, and Four Corners students who took the assessment two years in a row improved their scores about as much as the average Oregon student. The single-story brick building in East Salem opened in 1949 as Lincoln Elementary School, serving 199 students, according to Oregon Statesman articles from the time. It’s since been renamed and expanded to hold its current student body of about 500, with 28 teachers. Most students are Latino; about one in five are white. More than half of students are learning English, and not all of those speak Spanish. The school counted 11 languages among its students last year and, like many Salem-Keizer schools, has a small but growing Marshallese and Chuukese population. Located on Elma Avenue, the school is separated from Trinity United Methodist Church by a small parking lot, and otherwise surrounded by houses. Aside from the school’s field, there are no parks or community centers nearby. Busy Lancaster Drive is just a few blocks away. 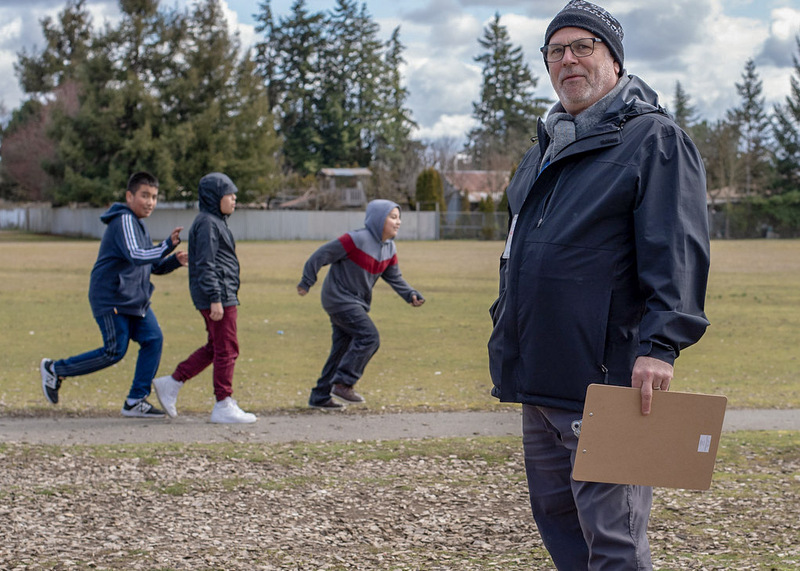 Its principal, Phil Decker, has been at the school since 2008, brought in from Swegle Elementary, another struggling, high-poverty school in Salem. During Decker’s time there, the school showed progress in closing its achievement gap and went on to win a state award for its improvements in 2009. District leaders asked Decker to come to Four Corners to improve its performance. Decker is the grandson of Yiddish-speaking immigrants who fled Russia and said public school is what allowed his family to learn English and become successful. His job is challenging: he spent a recent Friday morning with a student who shut down and hid under a table, then ran off school grounds after another student accidentally backed into him in the lunch line. But Decker said he never wakes up and dreads coming to work. “I feel like I’m always giving back to the next wave of immigrant communities and can really identify with these families,” he said. Demographically, the school looks similar to other high-poverty schools in Salem-Keizer, particularly those in east and northeast Salem. But those familiar with the school said they believe Four Corners students struggle more than their peers at other high-poverty schools, whether because of the surrounding neighborhood or some other factor. Annalivia Palazzo-Angulo, director of the Salem-Keizer Coalition for Equality, suspects the actual poverty rate at the school is higher than its official count of 88 percent, because many Latino families don’t want to turn in the application for free and reduced lunch. At Four Corners, organization works directly with families on literacy programs to help parents help their kids learn to read by third grade. Palazzo-Angulo said because the free lunch form asks for an optional Social Security number, it leaves many families unsure how the information will be used - especially because it’s shared with the federal government, she said. Decker has worked at other district schools with similar demographics and said Four Corners has no monopoly on challenged students. But when he arrived, he remembered thinking things felt “más agudo” - more intense. Last year, the school had 17 suicide risk assessments, several threat assessments and weekly calls to Oregon’s Department of Human Services, numbers “higher than most” elementary schools, he said. Many of his students have had traumatic experiences “and you would never know it. School’s a happy place for them because it’s safe and predictable,” he said. But there are a handful in every class who get easily frustrated with minor setbacks - changes in routine or difficulty with a lesson - and react by shutting down and rolling on the floor, yelling out in class or, on the extreme end, throwing school supplies. Decker and his staff have put more time and energy into being proactive so students don’t get to that point. 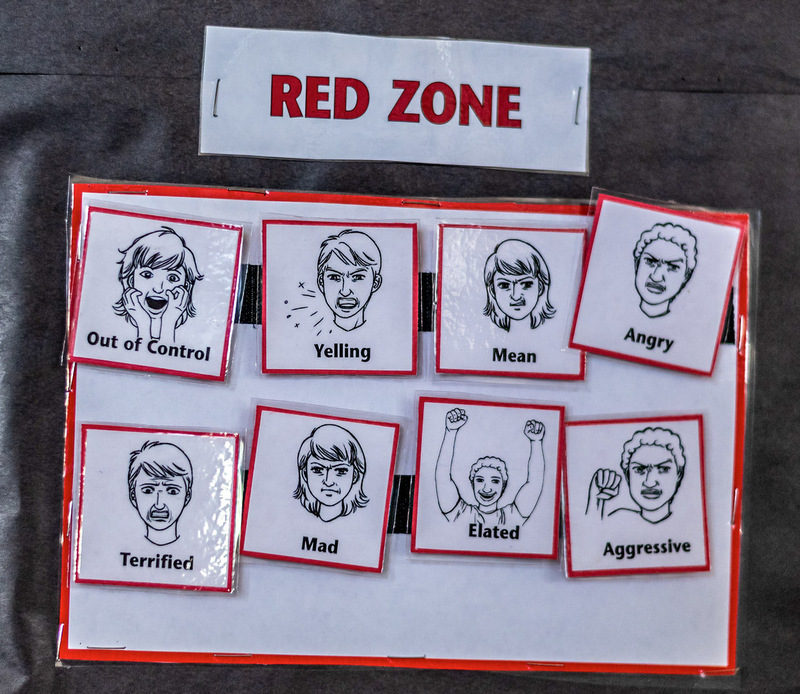 That includes classroom lessons on emotions and social skills, as well as resources like individual breaks for students who regularly struggle. “That’s becoming more and more something you intentionally teach. You can’t just discipline that away,” Decker said. Decker is a soft-spoken, patient man whose eyes light up when he’s explaining how his staff track how well students are reading, or when he’s ambushed by an 8-year-old for a surprise hug. He’s bilingual and has photos from his frequent trips to Michoacán, Mexico, displayed in the school’s hallway. He knows many students have relatives or ancestors from that area, and makes a point to greet families in their native language when they come to the school to pick up kids. His move to Four Corners came as the district was adopting Common Core standards, the first federal guidelines spelling out what skills students should master in each grade. Decker had hoped to quickly turn the school around, but found many basic systems lacking. Four Corners didn’t have a focused time for teachers in each grade to sit down together, review the standards their students were supposed to be learning and discuss how to best tailor lessons to student needs. The school was one of the last in the district to adopt that process. “None of that was here,” he said. His focus has been on establishing missing systems to help with academics and behavior, a process that, until recently, the school received little help from the district in doing. “This has to be change that’s sustainable,” he said. This year is the first Four Corners has had a set math curriculum from the district since the new standards were adopted. Previously, teachers had lists of what students were supposed to be able to do at each grade level - specific skills like “use four operations with whole numbers to solve problems” for fourth graders. But they were left to build their own lesson plans from school resources. Decker said some teachers might prefer using their own lessons over a standardized curriculum, particularly at schools where students have fewer challenges outside of class and teachers are more able to focus on teaching. But for his teachers, who often have to play social worker or use class time to address a student’s emotional needs, a ready-made curriculum is a vital roadmap, he said. “Other schools might not be in that situation. Their students might come in on or above grade level because of the support they’re getting at home,” Decker said. Basic Spanish-language materials for reading and math were also often inferior to the English versions, something Decker has for years pushed the district to address. Rodriguez said that gap has started to close, but bilingual staff still find tests of reading ability in Spanish are less consistent than those in English, making it harder to identify where students struggle. Much of Decker’s focus has been on reading, which he sees as the most basic skill students need to learn. “It’s your access point” to math and other subjects, he said. Small groups like the ones Rodriguez leads are guided by data: tests showing how well students are picking up new skills. The use of data has grown over the past five years, said reading teacher Kim Young. When Common Core came to Salem, teachers began talking about ways to help students who were struggling. But determining which students needed help and where to place them relied on teachers’ judgment. “There was a lot of ‘I think’ and ‘I feel,” Young said. Now, that’s been replaced by hard numbers. Every six weeks, Decker joins a group of Four Corners teachers to spend hours in a conference room looking at spreadsheets and graphs showing individual student progress. As students file off buses and down the wide main hall to class, teachers talk about how to help those struggling most catch up. Those discussions include shifting the reading groups students are in, but often go far outside the academic. A March discussion of second graders included children struggling because of homelessness, a parent fleeing an abusive relationship, and what a teacher suspected were undiagnosed learning disabilities. Those social problems have been a persistent challenge for Decker and his staff. This year, teachers told him they wanted to focus their professional development on behavior and classroom management to help kids focus on instruction, he said. Young said if students are having a meltdown or struggling to focus, teachers may have to stop instruction time to handle the problem. Some have told her they feel like they barely have time to teach. “Sometimes they have to sacrifice math time or reading time,” she said. And when Decker’s staff tell him they want support with students’ social problems and professional development around helping kids with behavior, that cuts into the funds and time the school can spend on instruction. It also drives turnover, he said. The school has dedicated staff who love being there, but it’s not uncommon to see very committed teachers move on after five or six years to another Salem school. “That makes it challenging to make growth,” he said. And though he has discretion with federal funds, Decker can’t use that money to pay retention bonuses or award extra money for working in a challenging school. Amid those challenges, burnout would be easy. Decker tries to focus on bright spots and keep his staff motivated with humor. He won a Crystal Apple Award for outstanding educators last fall after being nominated by school counselor Kim Siegrist. Nearly 30 educators at the school signed a supporting letter praising his community outreach efforts, which include home visits to struggling families, and working with the city on a safe walking path to the school. “He has created an environment where his staff truly believes the kids can rise above all the trauma they have experienced and succeed in education,” they wrote. 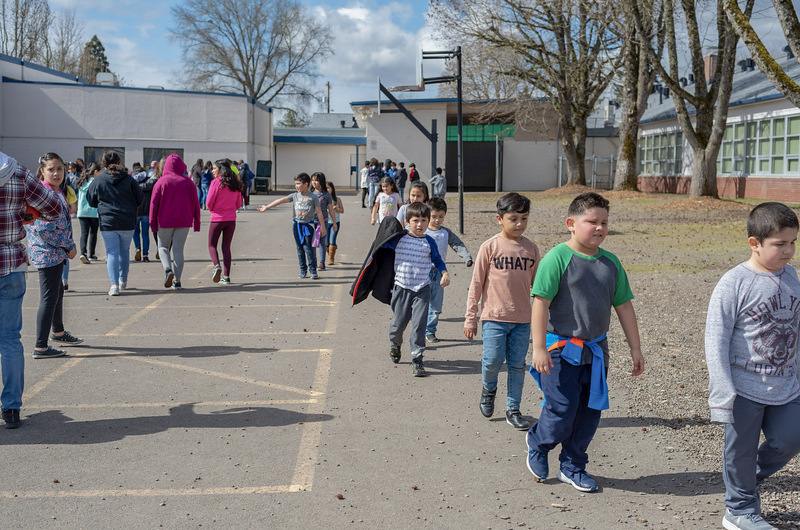 Four Corners has a higher attendance rate than many of its peer schools, something that earns the school points on Oregon’s new school evaluation system. Still, one-fifth of students were chronically absent last year, which is more than educators would like to see. This year, the school cites individual students as “champions” each month if they had 90 percent or better attendance and no behavioral referrals. Only 40 of the school’s 500 students have yet to be named a Champion this year. Decker said educators sometimes forget 80 percent of students are doing what they’re supposed to on a given day - showing up, ready to learn and demonstrating good behavior. “Every day is full of activity, challenges, excitement. It’s just good work and you just know your every day at work is making a difference,” he said. This is part two of a five-part series examining the Salem-Keizer School District's most challenged elementary schools. Coming tomorrow: Hallman Elementary School was once the worst-performing elementary school in Salem before a multimillion dollar federal grant helped nudge it off the list. Now, staff and a newer principal are trying to keep that improvement going. ﻿Follow Salem Reporter on FACEBOOK and on TWITTER. YOUR SUBSCRIPTION WOULD HELP -- Salem Reporter relies almost exclusively on reader subscriptions to fund its operations. For $10 a month, you hire our entire news team to work for you all month digging out the news of Salem and state government. You get breaking news alerts, emailed newsletters and around-the-clock access to our stories. We depend on subscribers to pay for in-depth, accurate news. Help us grow and get better with your subscription. Sign up HERE. 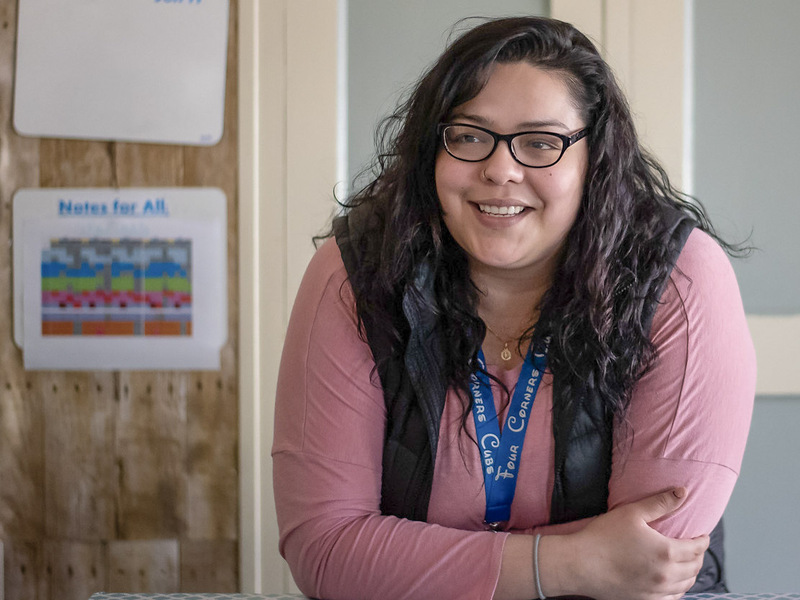 This week, we're publishing "Nine Into Six," a five-part series on the challenges Salem's high-poverty schools face getting kids who start kindergarten behind their peers across Oregon on track for middle school. Reporter Rachel Alexander takes you behind the scenes to share how this series came about and where we got our data.